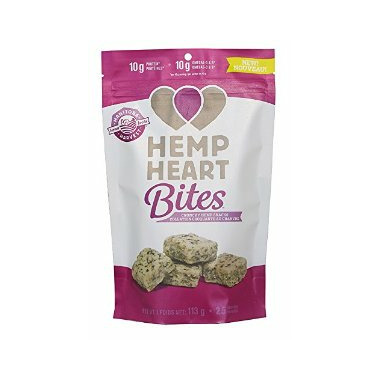 Made with the goodness of hemp, organic sweeteners, and a touch of sea salt, Hemp Heart Bites contain 10 grams of protein and 10 grams of omega-3 and omega-6 per 45-gram serving (about 10 pieces), making them the perfect addition to your lunch box or gym bag. So the next time you’re having a mid-day snack attack, help fuel your active lifestyle with a nutritious and delicious snack that will get you through even the busiest day! Ingredients: Hemp Hearts (shelled hemp seeds), organic evaporated cane sugar, organic brown rice syrup, organic vanilla flavour, sea salt. Delicious. It is a small bag, very filling, half serving of 5 satisfies the crunchy, sweet craving. Tastes good but like the other review said, it is a really small bag for the price. I love adding hemp hearts to smoothies, yogurt, etc, but on their own I'm just not a fan of the taste. If you love the taste of hemp, then these are for you! They're basically just hemp and sugar as they contain cane sugar AND brown rice syrup. Couldn't really detect the vanilla. Unfortunate, I really wanted to love them as hemp is so healthy for you. They taste really great, but it's a pretty small bag.